The second-longest-tenured member of the Hurricanes coaching staff, Don Soldinger enters his 16th season as an assistant with the University of Miami. Currently serving his 11th year as running backs coach, Soldinger is also in his fifth season as special teams coordinator. Soldinger’s career has coincided with rise of South Florida as a college and high school football mecca, and the veteran coach has been involved in much of that rich history over the last 37 seasons, both as a prep and college coach. His current tenure is his second as a UM assistant, having most recently joined the staff as running backs coach in 1995 for former head coach Butch Davis. He was promoted to special teams coordinator by head coach Larry Coker in February 2001, while retaining his post as running backs coach. Soldinger has shaped the careers of many of the greatest players in Miami history as he has worked with running backs, tight ends and linebackers during his two tenures at UM. Some of those players are Michael Barrow (New York Giants), Rod Carter (Dallas Cowboys), Najeh Davenport (Green Bay Packers), Derrick Harris (St. Louis Rams), James Jackson (Cleveland Browns), Edgerrin James (Indianapolis Colts), Willis McGahee (Buffalo Bills), John McVeigh (Seattle Seahawks), Winston Moss (Tampa Bay Buccaneers), Clinton Portis (Denver Broncos), and Alfredo Roberts (Kansas City Chiefs). A testament to Soldinger’s acumen as a coach is the fact that he has produced five of the six running backs in UM’s 77-year football to rush for 1,000 yards. Soldinger returned to UM in 1995 from Southridge High School, where he was head coach. He began his coaching career in 1968 at Coral Park High School and relocated to Killian High School in 1974. After three years, he progressed to head coach at Southridge High School and began his first tenure at UM in 1984 as linebackers and tight ends coach. 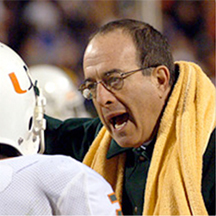 Following six years and one national championship (1987) at UM, he returned to Southridge as head coach before rejoining the Miami staff in 1995 as running backs coach. During 12 seasons as a high school head coach, Soldinger became a legend in the prep coaching ranks as he compiled a 104-35-1 record, winning two state championships and making four appearances in the state title game. Two times he was Coach of the Year by the Jack Harding chapter of the National Football Foundation and College Football Hall of Fame. Soldinger’s team also set a Dade County record for most consecutive victories at 29. As a player, he was a three-year letterman, defensive end and offensive tackle at Southwest High School.